Unique 6-high quality-heatpipe-down-draft style CPU heatsink. 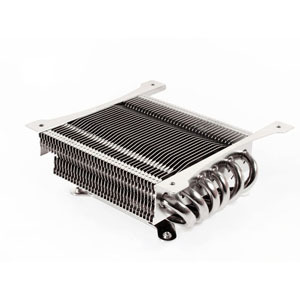 Super compact heatpiped CPU cooler at 45mm tall, perfect for HTPC system. Supports low RPM 120mm fans on a relatively smaller heatsink body. Decreases temperature on surrounding PC components. Supports ATX, microATX and mini-ITX form factors. Supports Intel LGA775/1366/1156/1155/1150/1151 and AMD AM2/AM2+/AM3/AM3+/FM1/FM2.